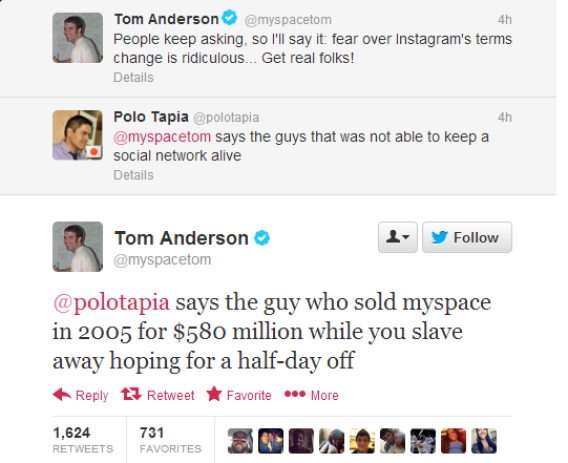 MySpace Tom: Anderson's Twitter zinger reminds us why we chose Facebook. 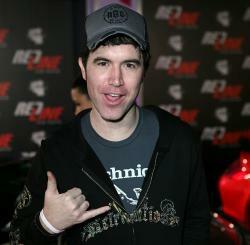 MySpace founder Tom Anderson in 2007, at age… um… who knows. Between that Aaron Sorkin movie, a few ill-advised instant messages, and a never-ending string of Facebook privacy controversies, Mark Zuckerberg doesn’t enjoy the most wholesome of reputations these days. But like a ghost of social media past, MySpace co-founder Tom Anderson has emerged from the shadows of obscurity this holiday season to remind us why we all chose Facebook in the first place: because Anderson’s site was so tawdry it made Zuckerberg’s look squeaky-clean by comparison. Anderson, as you may or may not remember, has been accused in the media over the years of lying about his age, not to mention a slew of other creepy antics. On the plus side, he takes some snazzy Instagram pictures. Zuckerberg, as it happens, was in the news this week for donating $500 million in Facebook stock to a local charitable foundation.